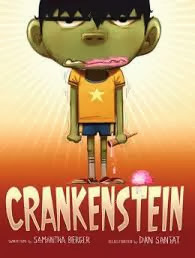 Crankenstein is an absolutely adorable picture book that reimagines your cranky child as a little Frankenstein monster. It's so cute! There are all sorts of scenarios in which Crankensten rears his cranky green head...waking up, eating breakfast, in the rain, in the cold, when he's sick, etc....there is a solution to Crankenstein, though, it may not be what you think! I think children will enjoy recognizing themselves in the pages of this picture book and getting a good giggle over all the times they themselves are cranky! The illustrations are bright and adorable and super fun to look at. Perfect for Halloween, but also just for all times! I received a review copy of this book from Little, Brown.